When one is moored in the centre of a city so full of charm and history that it gives one heartburn just wandering around it, the only thing that one can do to keep one's feet on the ground is to catch a bus to Ikea. Ikea in Metz is like our home port. Our boat has been furnished by it, and when a girl needs more coathangers, who am I to suggest we look downtown among the mediaeval maze? The good thing about visiting Sweden for a few hours is that it put Metz in perspective. The culture in the city has been constantly in a state of flux, eroded by newer cultures for thousands of years, captured and recaptured, Roman, French, German, French and so we shouldn't worry when we see a Vietnamese Butcher or a Spanish Bar, nor for that matter people overtly of religions other than Roman Catholic. I can't help but think that the patina of the place has been earned by such a diverse number of cultures and even countries that had we visited under similar circumstances thirty years ago, I may have been lost to it's charms, never to have been found again. Three days is not enough, but we are determined to move this time, in another direction. We shall as once was said in a different context, return, and when we do it will be for a while, and we'll find the shop again if it takes a year. The shop that was chocked to the rafters with "stuff" that had been there for a century at least, that sold rubber bands by the "each" and had every known variety of everything stacked somewhere where the proprietor could unstack, move a pile, look under something and find it by reaching into a burrow and feeling with her fingertips. We bought an egg beater from her for the price of a small car, and she was pleased to tell us the materials in it are "tres bon", and they are, all cast metal and polished in a way that things used to be done before China was invented. It will take more than a few gateaux before its price is amortised, but then our quarter of an hour in her shop was worth the admission. Come to think of it, maybe it was the Ikea gateaux that gave me the heartburn? 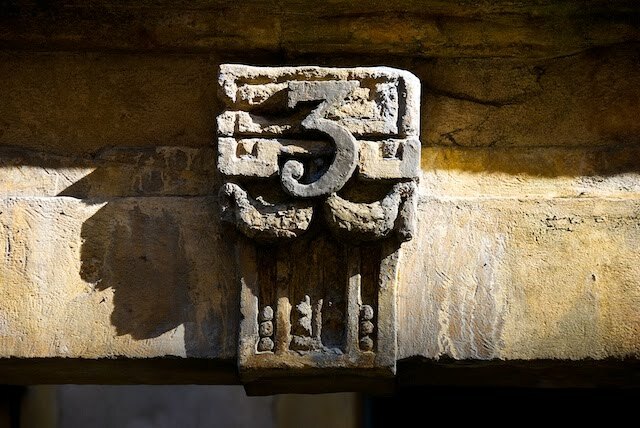 The three was a number on a very modest house in an alley we found ourselves lost in. No need for a road map, use google maps http://maps.google.com.au/ we do, a lot! I wondered about China..... although it is true that the locks for the canals here were engineered by an Italian bloke called da Vinci. I suspect the eggbeater might be something he left behind.